Clever Magazine, Summer 2019 " Stone Cliff "
An hour away from the chaos of our nation’s capital, in Virginia’s rolling hills, lies 10.5 acres overlooking picturesque Lake Manassas. This is home to Jean Buzby, and if horses could speak, the equine trio there would likely call it Heaven, or at least, Haven. Jean owned Sofie when she purchased the acreage; Shiloh and Oreo arrived later. 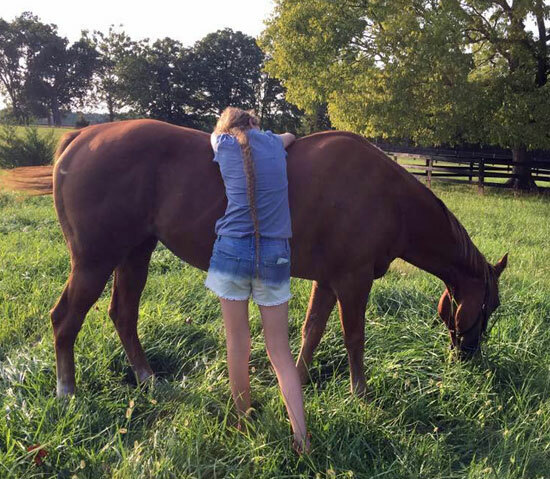 Sofie is a Hanoverian, purchased for dressage, but physical problems made that impossible. Horses being herd animals, Jean knew that in order to move Sofie from the boarding stable she would need companions. Jean also wanted an additional horse for her teenaged niece, Grace, to safely ride. The search began, with high standards. 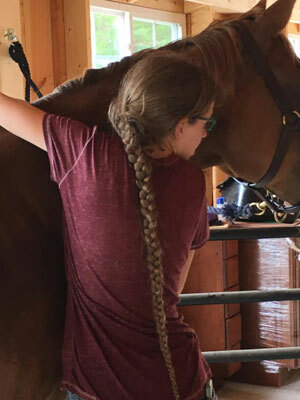 Jean and Grace scoured online sites and traveled to see several horses, including one that had a fist-sized knot on a front knee that was not visible in photos. Another time, they came close to buying what looked like the perfect fit, but the palomino failed the vet test. Sadly, some sellers are less than truthful about an animal. Months passed. Finally, Jean went to an auction with three criteria: A companion for Sofie, to rescue a homeless animal, and that it be a safe riding horse. She won the bid on a sorrel quarter horse mare. As one might imagine, Oreo’s white belly is sandwiched between a black front and behind. Unfortunately, although Jean has ridden Oreo, she spooks easily and Jean is reluctant to put Grace on her. Given Shiloh’s age and temperament; she’s not a viable riding horse either. Nor is Sofie, due to a neck injury. So, currently, there are no riding horses, Meanwhile, Grace is learning patience; to handle disappointment, and that for horse owners, the pasture isn’t always green. Lastly, there’s a young feral cat, Rasmus Knickerbocker, so starved that she was eating birdseed. Jean hopes to keep her as a barn cat to control rodents. Jean didn’t intend to manage a home for aging equines—she wanted saddle horses for herself, for Grace, and to perhaps offer trail rides. But she’s delighted that all her animals are happy and healthy denizens of her acreage.